Her dad is the funny man, but Jordan Foxworthy is dealing with some serious issues. Jordan’s trip to Kenya when she was 14 years old inspired her to do what she could as a teen to fight malaria halfway across the world. After a trip to Kibera, Jordan teamed up with Compassion International to develop the Bite Back Campaign, an initiative that raises money and awareness for the disease. Jordan, now 17, has raised $500,000 for the cause. She’s used Facebook and other social networking tools to challenge teens to donate $10 to purchase a mosquito net. Jordan encourages her peers “bite back” against the bug that kills more African children than HIV/AIDS. This entry was posted in Community contributors, Under 20, Worldwide reach. Bookmark the permalink. As a teen activist myself, i know there are issues you can run into as far as the sincerity with which people will take your cause; have you run into difficulties because of your age? There’s been some discussion recently about Christian Children’s Fund removing the word Christian from their name. Is Compassion really a Christian organization? They have a statement of faith on their site at http://www.compassion.com/about/statementoffaith.htm but was just wondering if it’s for real. Is really sad to have Malaria cases when the world has one heal to this illness, the richest countries must spend less in war an invest more in health. Hey, that is such a loving story and BTW I LOVE your dad! He is so funny! I know what Jordan is doing is amazing because a ton of people die in Africa because of Malaria and AIDs. Wow. I wish I could go to Africa. I really want to help them. My friends family supports a child in Africa. This is really great! Keep doing what you are doing and keep biting back! I think its great what your doing. Keep up the great work! hi i think what your doing is very good i have learned alot about malaria and i really want to do something like you when im older .i am also a big fan of your dad i hwish u best luck with you future. It is so nice that you care about Africa giving bed nets is a great way to make a diffrence maybe you should check out this great website http://www.nothingbutnets.net they get over 100 nets a day! Good work! Today,many people do not want to help others who are in need. Most of the people today, only think of themselves. Maybe, I will be one of them, too. It’s a very shy thing. Jordon-Foxworthy, she showed us what should we have to do and made us to think about us. Helping others is a very important to our lives,and she told us that true. We must take care of others sometimes, not only care about me. Sometimes, it is good to turn back to my past and examine myself. Keep doing things what you did and do your best. Maybe sometime, you will save many children and they will feel very thankful to you. You did very good job. I am very happy to read your story. 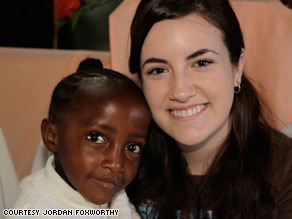 She is so nice because that Jordan-Foxworthy is care about Africa bed nets. Many of the people is not care about Africans, They just do their work. BUT she is cared about Africans. She has kind mind. I think she is very good. Jordan-Foxworthy, Keep up the great work!! I will see you everyday!! my opinion is i’ll do only give a money, i’ll go to the kenya or kibera and helps people, but, idon’t have a medical knowledge, but, they happy for speaking fraind and help they. so, she choice is not very good, but, her’s nature is very nice. I will promise I will see you. It is good for our earth. I think it is wonderful that such a young and mature girl has accomplished so much is such a little time. I wish her the best in her future endeavors. Jordan is great girl. If we send only $10, African children can prevent the malaria. If we have a little bit more attention, they can live happy life. I think she’s so great and she did a very good thing. I never thought before to help African or North Korea and the others who need help. Also, my mom told me that you can do it too, so I’m gonna try helping who need a help around me. I want to see her and going with her and learn more particular. The last big thing I learned from her is when we give help to someone, it doesn;t matter who it is. And then, feel the good for this story. In my view, Jordan has courage. Because, This work is hard and some dangerous. I want, many people know her honorable work. A any rate, Jordan did trying, good! I think it is so good for many people. Also, people think different ways each other. But, i think this is great happen. I’m same mind to Jordan. Really, i want protect the many children. I’m 14 years old and i’m very healthy. But African children are different. So i’m so sad and i’m help them together. The fast, African children have a big smile. I wish you! I think what Jordan is doing is simply splendid! Keep up the good work, Jordan.